I, however, started with the same idea that is still driving the company today: to create the best tools for image and video analysis specifically for forensics and investigations. Doing something very specific for a very specific kind of customer, but being the best in doing it and making it become the world standard. Some months ago, one of our very first customers (who has become a good friend), told me a story I had forgotten. I met him at one of the first forensic science meetings I participated in when I was still at university working on a project that laid out the foundation of Amped FIVE. He told me about some forensic video products that were already available at that time. I claimed to be able to do better and for a lot cheaper and he somewhat laughed about it. Imagine a student, claiming to do something better than companies that were already in the market for years. Yes, I was (and probably still am) naive and stupidly optimistic. “I’ve never used them. From what I heard, maybe [COMPETITOR NAMES] are the most well-known. From their experience, [ORGANIZATION NAME] were not satisfied by any of them, and this was the reason I started the project of my thesis; moreover, probably you know they are pretty expensive [COMPETITOR PRICE CONSIDERATIONS]. For half the price I can write you a better software 😉 joking (…but not too much). If you want I can let you try my software, but the interface is not the best and it is quite slow. It’s just a thesis work, but it has some good filters. This email was sent at the end of 2005, more than two years before founding Amped Software. So, if there’s one thing you can say about me, is that I am stubborn. It was a very ambitious plan for a student with very little experience of software development, no idea on how to start a company, and no experience of law enforcement and forensic work. But somehow, surely also thanks to some good luck, we’ve managed to survive and actually thrive so far. Despite still being a small company, last year we were recognized as one of the fastest growing tech companies in EMEA by Deloitte. As of today, our products are in the main forensic labs of most countries and we have trained users from all over the world. It’s taken a few years, but it has only been possible thanks to my team, our partners, and you, our fantastic end users! Thanks for supporting and believing in my vision, especially for those who believed, when I was still a stupidly optimistic student. It’s great to talk about the past and the present, but I know a lot of you may be wondering where we are heading. I don’t really like to reveal too much about things we are working on unless they are ready to be put in the hands of the users. But, rest assured, we are in one of the biggest improvement cycles in Amped history. We have some exciting developments under the hood. We are looking to expand our product line and features in many directions, but still focusing on the same vision. The current roadmap of our products includes a myriad of ideas and feature requests, mainly from users. We have more than one thousand items on the to-do list. We definitely won’t be bored for a while, especially since as we get more users, we get more feature requests. We probably can’t address all of them, but if you follow our release cycle, you can see that we are keeping up a pretty good pace. In addition to our current products, Amped FIVE, Amped Authenticate and Amped DVRConv, we have a few other major projects in development. There is one, in particular, we are putting a lot of effort into, so stay tuned! Since the beginning, we’ve tried hard to educate the users and the community at large about the importance of treating images and videos with the same rigor as other evidence, be it digital or physical. In many areas, there is a common misconception that anybody can analyze photos and videos. After all, we have been watching movies and producing family videos and photos all our lives. So, why is there any need for forensic image and video software? We still see experts using a myriad of free or unspecialized tools, importing and exporting from one to another to get anything done, spending a lot of time, and with very difficult to reproduce processes. Who would dare analyze a mobile phone these days, by just unlocking it and reviewing folders and apps, without the use of the proper tools? So why is this still happening with image and video evidence? This was often the situation when I started the company and, in many cases, it still happens today. But, we are seeing an improvement. We see that people are starting to realize that the value of our tools is not so much to “get that license plate” and the magic results introduced by the popular series à la CSI, but it’s the peace of mind obtained by working with an accurate and reliable workflow. This is something we strongly believe in and we will continue to advocate this in the years to come. P.S. 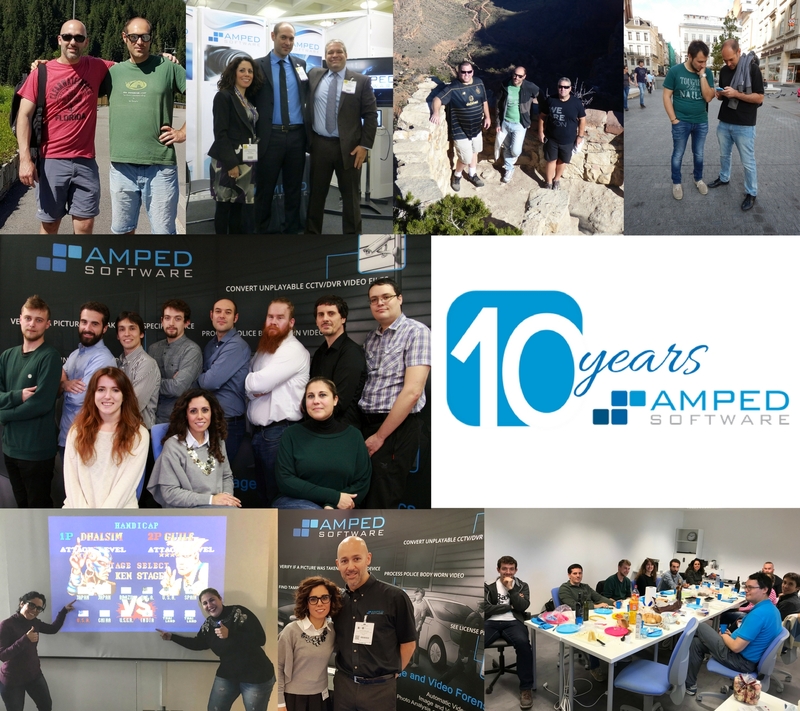 In honor of our 10 year anniversary we will have our first Amped User Day event, if you are interested in participating or getting more info, please go to this page. P.P.S. To help celebrate our 10 years, you may see some of our staff and trainers wearing these special t-shirts. You never know… they may have a few extras to give away! P.P.P.S. We are hiring! If you believe in our vision and want to become part of this fun (and somewhat crazy) team, check out the open opportunities here.